I am in love with Biscoff spread. I've made a couple of recipes with it, and I can't get enough of it! One of my favorite desserts is my Nutella Gooey Butter Cake. I decided to switch out the Nutella with some Biscoff spread and see how it worked. The result? O-M-G Freakin' Delicious!!! This cake called to me from the kitchen - "Eat me!". It smelled so good and tasted even better. Get a jar of Biscoff spread, and make this today! You won't regret it! It looks amazing. I have tried Nutella but not Biscoff. What is the flavor of biscoff? This cake does look amazing and I am sure that it is since everything you make is incredible. I am addicted to Plain Chicken! I have never heard of Biscoff, what is it? I made the nutella version for Valentines Day. Sooooo good. I will have to look for Biscoff spread. Gooey cakes are our favorites. Heaven's to Betsy !! I am so addicted to Biscoff spread and always trying to find ways to use it in recipes. 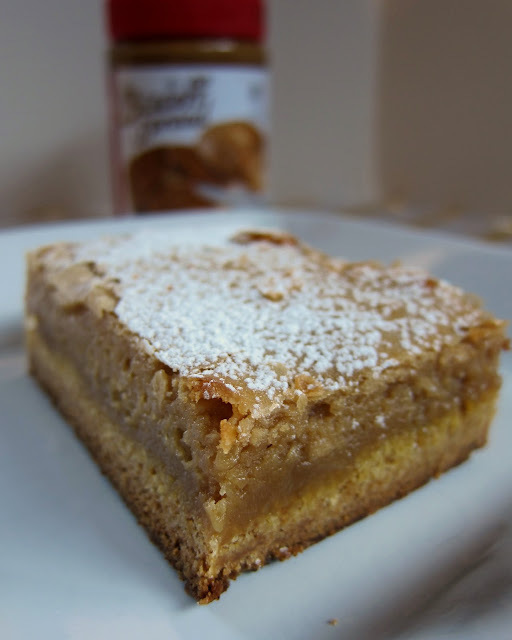 I never thought to make a gooey butter cake with it - I am SO making this cake this weekend !! I have yet to make a Gooey Butter Cake. But this is where I begin! I love the Biscoff spread. thanks for sharing a yummy recipe. Wondering what Biscoff flaver was, I bought the ingredients for this yummy looking cake, while making it, I couldn't stop dipping my fingers in the batter! While the cake was baking, the whole house smelled like a sweet bakery and my kids couldn't wait for it to finish baking. This cake was fabulous!! Btw, Biscoff is a sweet spread (usually by the Peanut Butter in the grocery stores), popular in European countries. Can't wait to make this cake again! I just took this out of the oven & it's making me crazy waiting for it to cool! I also crushed up 3 or 4 Biscoff cookies & sprinkled over the top before baking. Yum - thanks for the recipe!